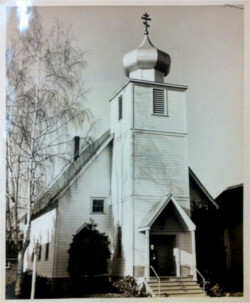 From the first time a group of Russians, Serbs, Greeks, Alaskan Aleuts, and Arabs gathered in a tiny house in what is now inner Southeast Portland for the first Divine Liturgy in Oregon in 1890, St. Nicholas has been the spiritual home to people of a variety of ethnic origins. 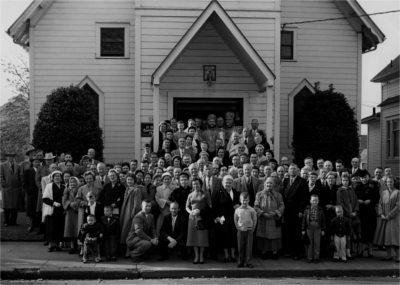 Fast-forward more than a century to a small parish where the city of Portland begins to spread into its Southwest Portland suburbs. Here, you’ll find a variety of backgrounds — “American-Americans,” along with Serbs, Russians, Bulgarians, Eritreans, Estonians, Romanians and others — gathered for one purpose: to worship Christ. 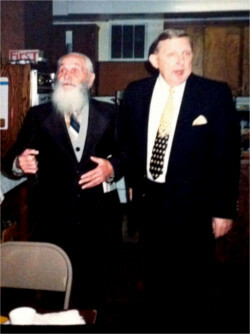 Our “ethnic” Orthodox parishioners enrich our parish life with their music, customs, and food. And more than 70 percent of us came to Orthodoxy by our own choice from other faith traditions — Christian, non-Christian, nonreligious. Our different origins make for a welcoming parish, a place where just about everyone can find somebody who has walked a similar journey. And in one Lord Jesus Christ, the Son of God, the only-begotten, begotten of the Father before all ages. Light of light; true God of true God; begotten, not made; of one essence with the Father, by Whom all things were made; Who for us men (anthropoi) and for our salvation came down from Heaven, and was incarnate of the Holy Spirit and the Virgin Mary, and became man (anthropos). And He was crucified for us under Pontius Pilate, and suffered, and was buried. And the third day He arose again, according to the Scriptures, and ascended into Heaven, and sits at the right hand of the Father; and He shall come again with glory to judge the living and the dead; Whose Kingdom shall have no end. 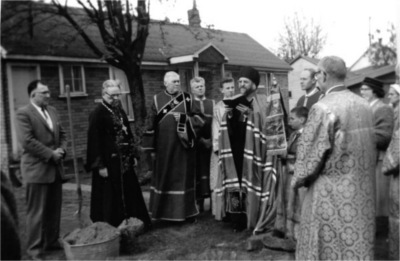 We sing that statement of Faith at every Liturgy, as do all Orthodox Churches in the world. When you ask parishioners why they keep returning to St. Nicholas, several themes emerge. St. Nicholas parishioners say they came back for a second time — and third, and on to membership — because of the welcome they received. After (nearly) every Sunday Liturgy is a full lunch — and everyone is welcome, both members and first-time guests. If you come for a Sunday service, plan to stay for “coffee” — which might include anything from soup and sandwiches to a salmon barbecue on special occasions. Sit down with us and ask any questions you might have about what you’ve experienced. We love stories — both listening and telling. We have a very old parish, founded in 1890, and it’s also a very eclectic parish. 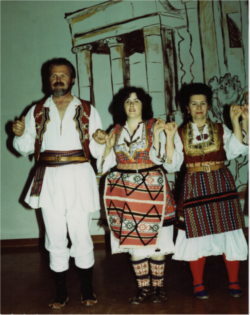 We have people from many ethnic backgrounds, as well as “American-Americans,” who come to Orthodoxy from other traditions. So no one needs to be concerned that they may not be welcome because they come from a different worship experience, because someone here probably has the same background. 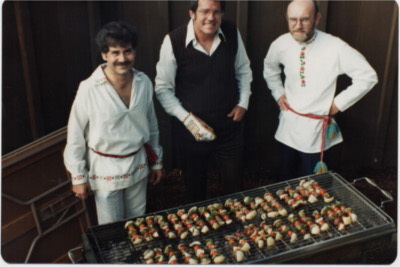 The parish was founded by Russian immigrants, and, although the community is now composed mostly of converts, the Slavic tradition, both cultural and spiritual, enriches the parish community. 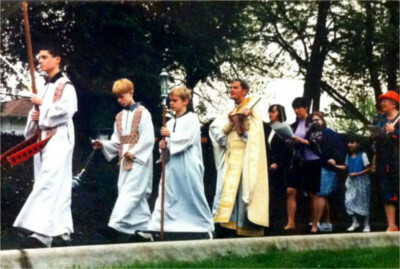 St. Nicholas is an ‘American’ parish, in that we have so many enriching traditions. It widens your view of Orthodoxy. I think that our brunches are one of my favorite things about St. Nicholas. They are a great way for new to our church community or those visiting from other areas to get to know us. St. Nicholas is a family-oriented parish. We have luncheons and break bread together after we receive Communion. That’s very important and very welcoming. St Nicholas Orthodox Church has a diverse community of people who use their varied talents to make the church a rich environment for all. I love that St. Nicholas parish feels so much like family and that we are all happy and grateful to have such a beautiful place to gather together to worship. People are genuinely welcoming, and the atmosphere is one of joy and celebration. Truth be told, we’re not the most rigorously Orthodox parish in town. We’ve been known to forget to read the fine print on dinner rolls we served during Lent, and we don’t impose (or forbid) liturgical practices of any particular ethnic origin. But we do work to find and keep the essence of the Faith as delivered to the Apostles and in a way that is speaks to the world as we find it. The result is a group of people who live out their faith every day, falling down and getting up like everyone else. And the conversations you’ll find at coffee hour have a spiritual dimension even as we talk about everything from families to jobs to church politics to pop culture. I’ve found that people at St. Nicholas generally want to grow closer to God. They’re not ‘nominal.’ The parish is a place to grow spiritually, not just go to church. I love St. Nicholas Church because of its efforts in keeping it real. Every parish has people with needs, both within the community and around it. St. Nicholas truly cares for its members and particularly shines when assisting its members who are facing challenges in life. There is also attentiveness to the needs of the poor and alienated of the larger community. 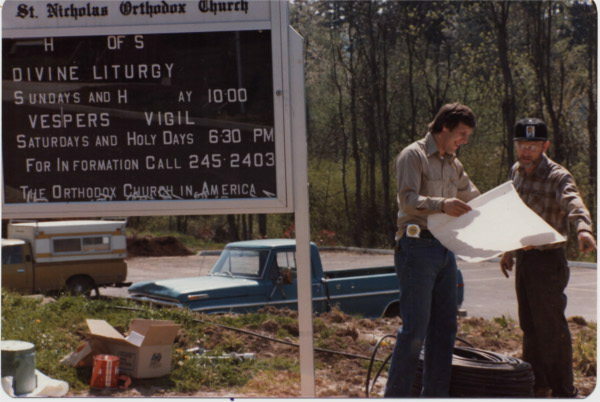 Father George helps people find the Church established by Christ and the Holy Spirit. If you look hard, you can see the lineage of the Church, stretching back to Christ’s ministry on earth. The result is a strong Church family, connected and rooted in the Spirit. St. Nicholas Church is a place where, under the guidance of the Orthodox Tradition and the authority of the Apostolic Church, individual Christians can find their way. Emphasis is given to growing in the Spirit through the sacraments and communal worship, fellowship and prayer, teaching and service. People of all ages, all backgrounds, of any or no religious faith, are drawn back again and again for the beauty of the church. 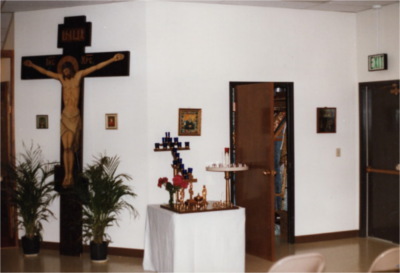 The first impression begins with our “temple,” completed in 1996, with architecture that offers a mix of Traditional and modern that well represents the parish as a whole. Built in a traditional cross-shaped design, the church features substantial wooden beams and a light hardwood floor, resonating with its Northwest origins. When you walk through the doors, you’ll find our octagonal baptismal font — symbol of our means of entering the church. At the doorway between the narthex — or entryway — and nave — or main section of the church building, you’ll find a mosaic of two peacocks with grapes and wheat — ancient symbols of immortality and the Eucharist. Both visitors and longtime parishioners are transported by the massive iconography by Heather MacKean. On the ceiling of the central dome, Christ, the Ruler of All, blessing the congregation. 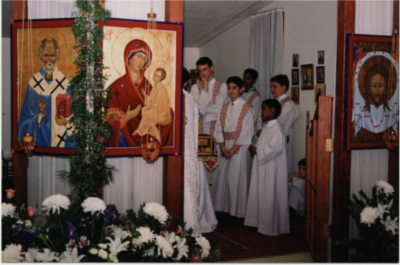 Above the sanctuary (where the Eucharist is prepared), the Theotokos (Virgin Mary, literally “God-Bearer”) sits enthroned, and below her, Christ distributes Communion to the Apostles. 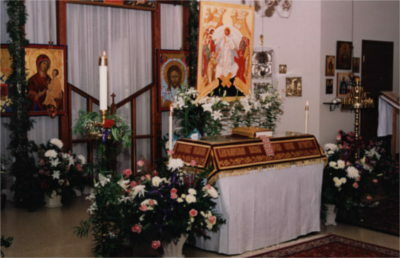 On the iconostasis, the wall of icons between the sanctuary are St. Nicholas, the Theotokos, Christ, and John the Baptist. The Royal Doors at the front have the four Gospel writers, and the side doors have Cherubim. On the south wall is a group of saints who created music, and scheduled for the north wall is a companion grouping of American saints. The music also draws people back. The choir is made up of real parishioners, who volunteer their time out of love of the church and the music. The choir director, Tracey Edson, is a professional musician and teaches music at the University of Portland, but he, too, became a parishioner before joining and eventually directing the choir. You’ll hear music from a variety of cultures — from ancient Byzantine chant, from the churches of Eastern Europe and the Middle East, as well as from the fledgling American Church. 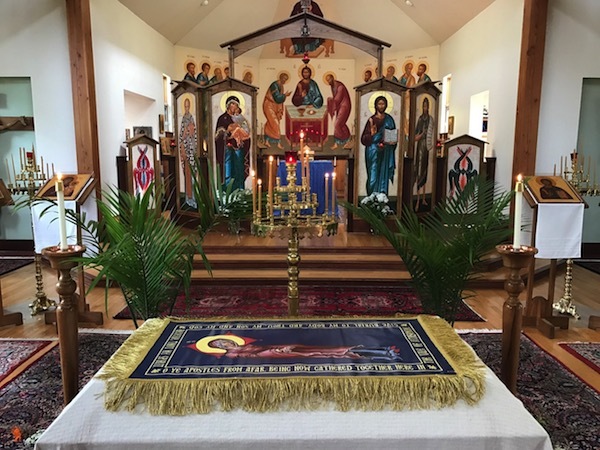 Father George often tells visitors that Orthodoxy speaks to all the senses, and the people of St. Nicholas have worked to make that multisensory experience as close a representation of Christ’s Kingdom as they could manage. I love the music — the quality and the variety. Heather [MacKean] has created such amazing beauty with the iconography, Father George is so real and I always learn something from him about our faith. Tracy and the choir are beyond amazing. I love our parish and cannot imagine going anywhere else! Times of prayer are times of concentration in the sublime. One can feel the interchange between supplicant and God. This attentiveness is punctuated by signs of the cross, occasional bowing, and multiple interchanges between priest and the congregation. The musical life of the parish is vibrant and energetic, and art in the forms of icons and presence of fresh flowers abound. And development of one’s spiritual life is encouraged through occasional quiet days and retreats. The full-meal deal. The music and hymnography teach and inspire, move, communicate, explain, engage; they speak to our listening. I once told Father George that when I first came here, I did not find Orthodox services to be incomprehensible. It was as if I came to this Place with a treasured and familiar book or script. But here in this Place every word and nuance of my treasured script exploded in a choreography of the senses. Color and Motion . . . Music and Smell . . . Taste and Light. And depth and breadth of which I had never known . . . and had ever known. We have been blessed with an excellent choir that leads and enhances our worship. For me the inspiration and beauty of the Orthodox church is the music. It is so rich with meaning. I appreciate the abundant singing and eating we have at St. Nicholas. The singing is central to worship during our rich services, and the eating is a response to our celebrations and feasts and even, of all things, our fasts! 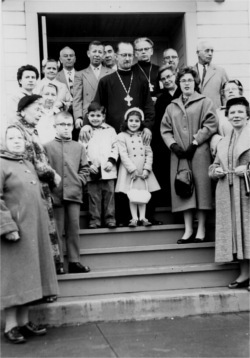 Who Is St. Nicholas Orthodox Church? St. Nicholas Parish is made up of people from various backgrounds with different stories. We strive to follow Christ in our everyday lives as well as our worship, and we invite you to join us on the journey. Many different ethnicities are represented in our parish. Welcome!